Click on the Resources tab at the top of this page to read our series of factsheets explaining how we used systems thinking in Prevention Tracker. Prevention Tracker worked with local communities to better understand their prevention system; how the people, processes, activities, settings and structures in that community all connect to influence the health of local populations. Chronic diseases are Australia’s greatest health challenge. Lifestyle factors such as smoking, harmful alcohol use, poor nutrition and physical inactivity are causing a massive increase in chronic diseases including cardiovascular disease, respiratory disease, cancer and diabetes. Almost half of all Australians have a chronic disease and these diseases lead to eight in 10 premature deaths. It is becomingly increasingly clear that we need to change the way we think about prevention if we are to buck these trends. Systems thinking has been used to understand and manage complex problems at a local and global level. It’s both a way of thinking and a practical tool to help tackle complex problems. It helps us to see the big picture – how the problem we’re trying to solve is made up of connected and inter-related components, so that a change in one part will influence other parts. In cities and towns all over Australia, many different organisations, people and programs work to reduce the risk of chronic disease for the people in their communities. This work is not just happening in the health sector – people and organisations in education, transport and local government among others all make contributions that can improve their communities’ health. However, little is known about how these people, activities and networks interconnect to shape a local prevention system. Understanding these interconnections, using systems thinking tools and methods, may be the first step to the design of new ways to intervene for chronic disease prevention. How did the project address the issue? Prevention Tracker was a national project that explored how local communities work to prevent chronic disease. Expanding a pilot project in Glenorchy, Tasmania, Prevention Tracker worked with four communities across diverse areas and populations to help us to better understand local communities’ prevention systems and then guide and monitor communities’ work to prevent chronic disease. a prevention system, and how they connect to make the whole, we can make better decisions about where and how to intervene to bring about improvements. Prevention Tracker described each of these system parts and their interconnections by testing a range of methods in real life community settings. The Prevention Tracker team worked closely with local communities to describe and understand their local prevention system. Community workshops to identify the complex causes of chronic diseases and opportunities for community-led actions for change. Once we described the local prevention system to begin to understand why things are the way they are, the next question was where and how to intervene in the prevention system. Like all systems, prevention systems are dynamic and constantly adapting to changing circumstances. As a result, ‘action learning’ was a key part of Prevention Tracker. This meant working closely with a team of local stakeholders who had the capacity and authority to implement strategies and assess their impact. With this team, we identified where and how to intervene to bring about systems change. An important part of describing and guiding system change efforts is knowing whether these efforts are making a difference. We drew on local data to identify indicators of system impact and progress towards achieving goals that strengthen the local prevention system. We were able to compare and contrast the communities to identify a suite of common methods and inquiry processes best able to describe, guide and monitor system change in local prevention systems. Prevention Tracker provided unique opportunities to work with a number of communities to identify a suite of methods and processes that other communities could use describe, guide and monitor their own efforts to prevent chronic disease. The project also generated rich information about the strengths and challenges of this type of model in local communities. There is a high level of prevention activity happening in communities, however the Prevention Tracker team was unable to identify a consistently visible prevention system like other social systems such as healthcare or education. Organisations undertaking prevention are connected in varying ways such as sharing information and resources. The prevention workforce is often part-time workers, including many volunteers; people working in prevention do not always see themselves as having a prevention role. Systems mapping enabled local stakeholders to engage with data and identify systemic problems in prevention. Systems-action learning processes enabled practitioners to have an impact in the broader chronic disease prevention system. This project developed methods for identifying and measuring local prevention systems. It provided data that has allowed us to make comparisons over time, both within communities as well as across different communities. Our vision is that working with communities in the application of systems thinking tools and processes will increase local capacity to address the complex problem of chronic disease prevention. We acknowledge the invaluable input into this project of our colleague, mentor, and above-all friend, Associate Professor Sonia Wutzke (1970–2017). The public health community is richer for having had you as one of its most passionate advocates. This project was funded by the NHMRC, Australian Government Department of Health, NSW Ministry of Health, ACT Health and the HCF Research Foundation. 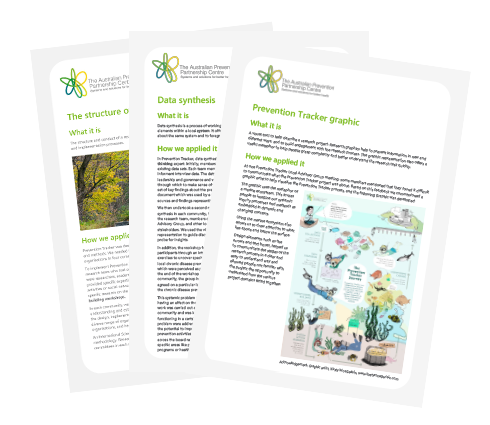 This series of factsheets describes how we used systems methods and tools in Prevention Tracker. To access the interactive terms in each PDF, download and read in Acrobat or Reader. Conte K. Community organisations have a role to play in prevention – but what do they think it is? Insights from Prevention Tracker. 23rd IUHPE World Conference on Health Promotion. Rotorua, Aotearoa New Zealand, 10 April 2019. Conte K. Collecting and interpreting programmatic data in communities. 23rd IUHPE World Conference on Health Promotion. Rotorua, Aotearoa New Zealand, 10 April 2019. Hopkins L and Jones K. Prevention Tracker Workshop, Australian Health Promotion Association symposium. Canberra, August 2018. Roberts N. Prevention Tracker: putting systems science to the test with local communities, World Congress on Public Health, Melbourne. April 2017. Riley T. World Leaders Dialogue: Exploring Systems approaches to chronic disease prevention, World Congress on Public Health, Melbourne. April 2017. Riley T. Living with uncertainty: behind the scenes of Prevention Tracker, World Congress on Public Health, Melbourne. April 2017.